The simplest way to fix this is to open with windows notepad, then select File > Save As - Next ot the SAVE button, select "UTF-8" from the encoding picklist and then SAVE. 2. How do we create recurring payments from Import Files? 3. What fields are required to import tokenised cards? When importing and uploading you should try and include as much contact information information as possible. This will help for the matching de-duplication. If you are looking at importing cards that have already been charged and you'd like the next payment to be scheduled, then you will need to have the next payment due date as well. The setup of this is currently outside of the product and our support, please contact info@payments2us.com to purchase premium support or consulting services. 4. 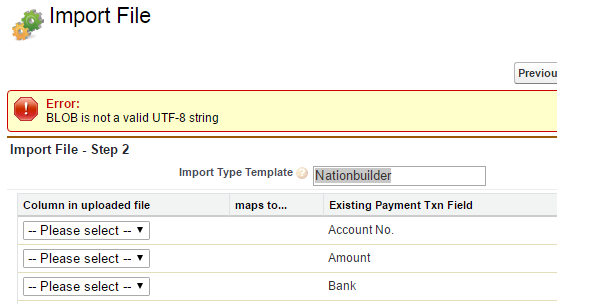 How can I Import Direct Debits? For Direct Debits, your Import File type selected on the first step must be "Direct Debit". From version 6.14, the name can have a " - suffix" appended to the name, e.g. "Direct Debit - Initial Load". The Direct Debit mapping is not delivered with the product by default. You will need to set this up on the first import by saving the Import File Template on Step 2 as Direct Debit. 5. Do I need to do anything about the warning that is displayed in step 2 of the import file process? 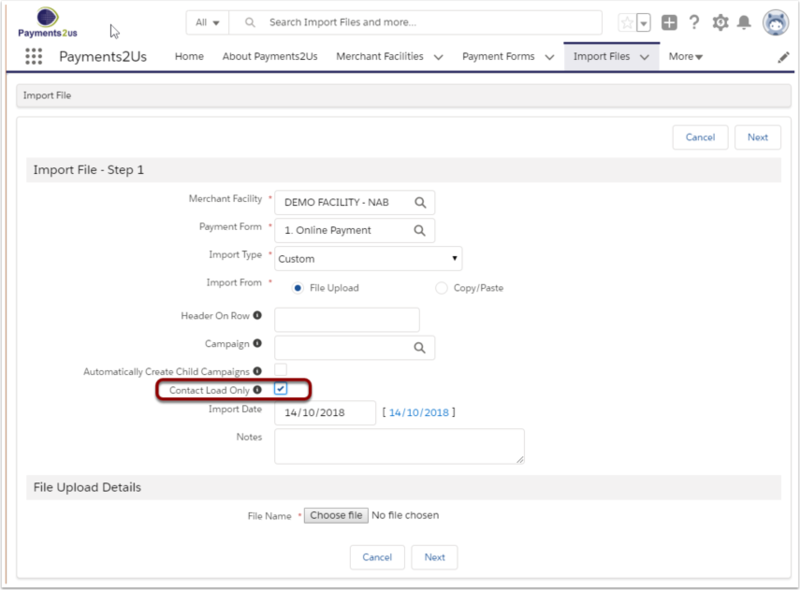 The warning "This Import Line Item field has no equivalent in the Payment Txn Object" message indicates that the Import is being uploaded, but will not stored on the Payment Txn object as part of the down stream processing. Many of these fields have special meaning and are only temporarily used as part of the upload process. However, should you add a custom field to the Import File Line Item record and this message appears, then it may indicate that you have an issue or a typo. The normal reason for adding a custom field is so that the imported (Import File Line Item) is so data is uploaded to the Import File Line Item and once the Import File is processed, this value will be copied to a field with the same API name on the Payment Txn. The ultimate aim is to then have the field on the Payment Txn copied to the field of the same API name on the Account, Contact, Opportunity or Campaign Member objects when the batch processor runs. 6. How many rows of data can I Import? The imports are not restricted by the number of rows, but by the overall size of the CSV file. If you have a smaller number of columns, then you can Import more rows of data. As a general guide, you should be able to import 30,000 and possibly upto 55,000 rows of data. Should you require more rows of data than allowed, then simply split your files into multiple CSV files and import seperately. 7. 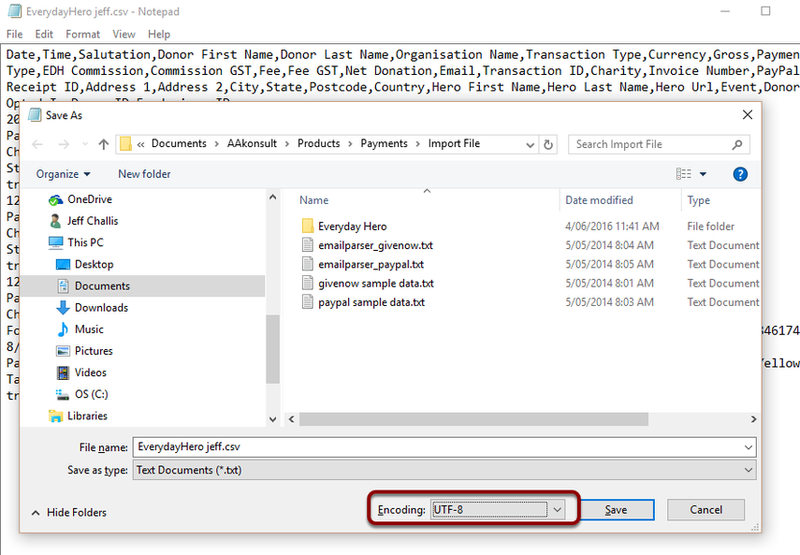 Should I import Credit Card and Direct Debits in the one Import Batch? Our recommendation is to split the two imports out. One particular thing to keep in mind is that Direct Debits need to have the Import File Type set to Direct Debit (See FAQ above on How to Import Direct Debits. 8. Should we import fundraisers first? Absolutely. In particular if you are looking to Soft Credit a fundraiser, then we recommend importing the fundraisers and selecting the "Contact Only Load" on the first step. 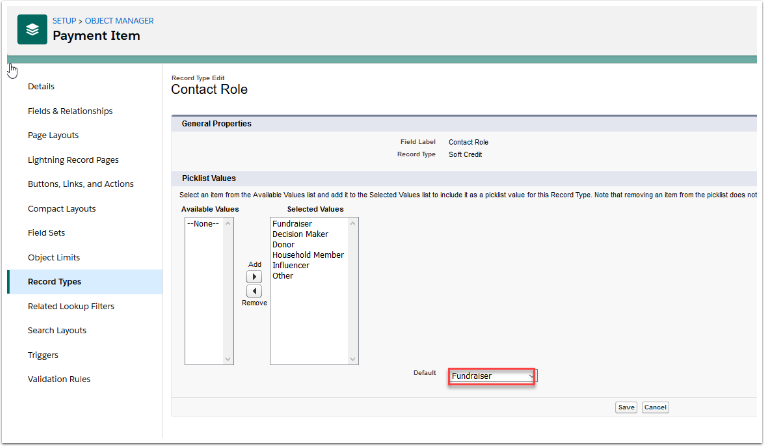 The Contact Only Load checkbox will import the contact and de-duplicate the contact with existing contact or create a new contact if they do not already exist. This will NOT create any related opportunities though. Loading the contact first will ensure the contact can be found and when using the Nonprofit Success Pack, can be soft credited for with the subsequent uploads. Most of the 3rd party providers only provide a few details about the fundraisers in their import files. These details are often just First Name, Last Name and Fundraiser Id's. The Matching Process relies a lot on the Fundraiser Id on the Contact record already existing. 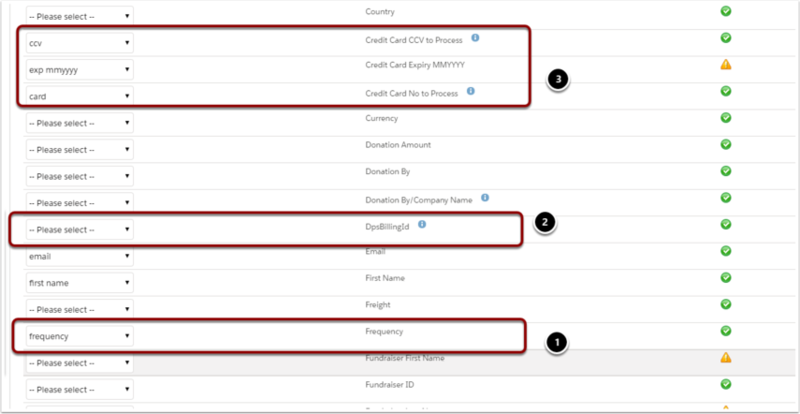 The best practice is to Import the Fundraiser details first, then import the donation details as a second import. When importing the Fundraiser Details, you can use the "Contact Load Only" option so that the process does not expect to be processing donations. If this option is checked, the creation of opportunities will be turned off. Note: Make sure when the fundraisers are imported to be created as contacts first, map them to the First Name, Last name fields. Then in the donor import after the fundraiser import, the fundraisers' first and last names are to be mapped to Fundraiser First name, Fundraiser Last name fields. To try and locate the cause of this, please check the following. Check error logs. First check against the import file line item to see if there is an error reported. If not, go to the Error Log tab and look at Errors created for today. This is the most likely area to have the reason for the error. It could be that a validation rule or a process builder that has been added to your instance is causing the issue and the error log will contain a description of the issue. Check on Import File Line Item and Payment Txn. Are there any fields with the same API name. E.g. AAkpay__receipt_number__c is the same as receipt_number__c. Please check all custom fields that have been added. It might be that we've added a field with the same name to a future release and that is why it is now causing an issue. Rename the custom field with a duplicate name. Navigate to Setup. Search "Apex Jobs". Locate the importprocessor jobs. Does an error show here? 11. In Peer-to-Peer imports, the fundraiser's contact role is being listed as Soft Credit, but I want it to be listed as Fund Raiser. How do I update it? The NPSP application allows for soft crediting to contacts. It is based on the the contact role field is part of the Payment Item object. 2. 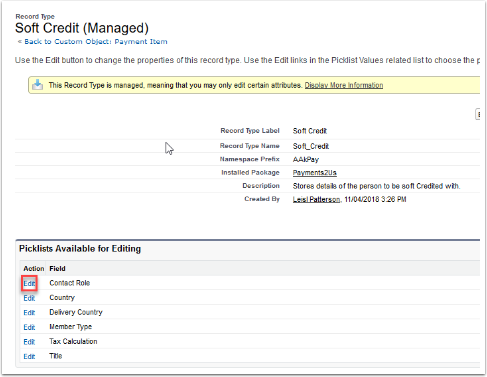 Select the Soft Credit record type. 3. Select Edit next to the Contact Field. 4. Select Fundraiser as default. You can repeat this procedure if you want to add the same or different default to other Record Types. The template mappings are saved into a Custom Setting File called AAkonsult Import File Settings. The users will need to have the profile setting "Customize Application" enabled. Campaigns that are visible to the user and are active are considered. If multiple Campaigns with the same name exist, then the one with the highest Start Date is used.